Combine flour, baking soda, and salt in a bowl. Beat 1 cup sugar and 3 tablespoons melted butter with a whisk until well mixed. Add eggs and beat until smooth. Stir flour mixture and milk into egg mixture until batter is well blended. 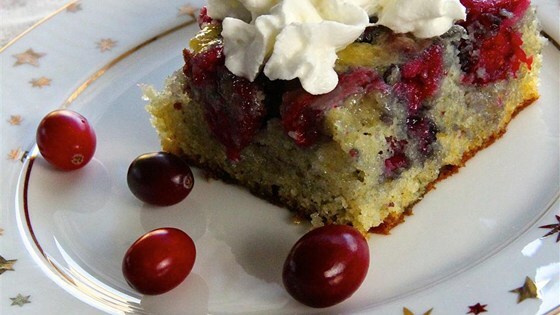 Fold cranberries into batter until just mixed and pour into prepared baking dish. Bake in the preheated oven until a toothpick inserted into the center comes out clean, about 30 minutes. For sauce, heat 1 cup sugar, 1/2 cup butter, heavy cream, and vanilla extract in a saucepan over medium-low heat; cook and stir cream sauce until sugar is dissolved, about 10 minutes. Pour hot sauce over hot cake. Allow cake to cool in the baking dish for 10 minutes before removing to cool completely on a wire rack.